Actress Patsy Kensit has said she was so upset to find her grandfather was a criminal on TV show Who Do You Think You Are? she stopped washing her hair. The Holby City star told the Radio Times she also started binge-eating burgers after it was revealed he was imprisoned for theft. Kensit opens the new series of the genealogy show, which also features Jerry Springer and Esther Rantzen. The actress, who was already aware that her father had been imprisoned and had links to the Krays, decided to make the programme to get some "closure" about her family past. "Dad died when I was 17, so I stupidly thought that this would be quite a romantic notion to find out about my ancestors. I just didn't realise it was going to be so sad," she said. The revelation that her grandfather had been absent from her father's childhood while he was in prison sparked the downward spiral. "I was so livid with him that I hit rock bottom. I kept thinking how stupid I was to think that I could deal with this. I genuinely didn't want to know any more." "It hit me so hard, I stopped washing my hair and wearing make-up," she added. "I was so depressed that I started binge-eating on burgers and pie and mash. I was so scared of how it was affecting me that I said, 'I can’t do this any more' and went home and locked myself away." The actress said a more positive revelation about her family history helped her to recover. "When the vicar told me his work was so valuable that they were going to write a book about him, I felt a huge weight coming off my shoulders. It was an astonishing story," she said. "That was the moment I stopped eating burgers and started washing my hair!" Kensit said the whole experience of delving into her family history for the programme made her "appreciate everything I have". She added that she was "glad" she returned to the show, having wished she had not walked away from the part of Ross's English girlfriend in US TV comedy Friends. She was replaced by Helen Baxendale, having decided to sort out her troubled marriage instead. "I've regretted that ever since, so I thought I'm going to see this through. I'm so glad I did," she said. 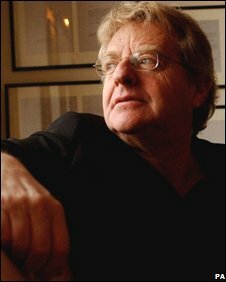 The show also sees US talk show host Jerry Springer break down in tears as he delves into German Jewish family's past. His parents were refugees who fled to London, where he was born in an Underground station. "I felt very vulnerable," he said. "Telling my own personal story like this is not something I'm used to. "But when I saw that horse wagon [used to transport Jews to their deaths in concentration camps], I didn't care about the cameras or who was watching me. "The cameraman was crying, too. I guess we were both just thinking about what those people must have gone through."